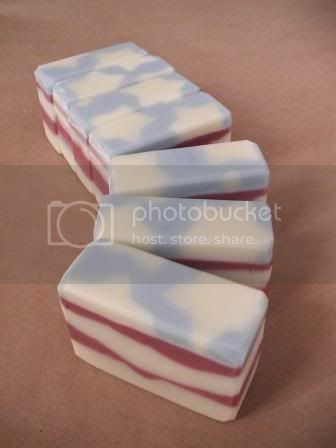 Teach Soap • View topic - American Flag Soap Contest! Oops! The picture has not shown sucessfully? How am I gonna have to do that?? Thanks Anne-marrie for bringing me out to the forum. I'm glad to share our AF soap, of course, entering the flag soap contest is the fun part! I used rose clay and a little of oxide for red part of layers and ultramarine for blue layer on top. I cookie cuttered the stars in advance and place them on the last part of red layer and lastly filled with blue layer. Post subject: AF Soap there we go! I tried photobucket.com and it finally worked. (Sorry I wasn't able to edit the post that I just made...)Thanks! Wow, that's very pretty and unique! A smile makes the world go round. sorry everyone for making that pic so huge-it's the first pic I have ever posted on a forum!